As 2010 winds down, it’s time to pick a Calgary Grit Person of the Year for the 7th consecutive year. The criteria is simple – a person who made an impact on the Canadian political scene in 2010 (ruling out obvious choices like the PM, or lame picks like “you“). But this was a tough year, with no obvious choice once it became clear that I couldn’t contort the criteria to give the award to Sidney Crosby. Federally, 2010 was about as dull, meaningless, and mundane as it gets. No election. No crisis. No bold policies. No leadership races. Wake me up when it’s 2011. If I had to pick a federal politician, I’d have to go with my buddy, Tony Clement. He was, after all, at the centre of the largest stories of the year – the Census, Potash, the G20 Summit. So convinced was I that Tony should be the Man of the Year that I sent him an application form – alas, he never filed it out, so I had to look elsewhere. Now, the “political person of the year” doesn’t have to be a politician. Ivan Fellegi and Munir Sheikh could have been joint winners for turning the Census into the unlikeliest of issues. A wild card pick might have been the kids who set up the “anti-prorogation” Facebook group. But in both cases, Harper seems to have recovered and the probability of long term damage is low. In my mind, 2010 was all about municipal politics. Some people think municipal politics don’t matter, but they must if people like Jim Watson, George Smitherman, Judy Wasylycia-Leis, Maurizio Bevilacqua, and Inky Mark leave provincial and federal politics for a chance to run (and in some cases, lose) municipally. Of all the mayoral races in 2010, none were more fascinating, surprising, or memorable than these two. In a city overrun with “pinko cyclists”, a loud Ralph Klein clone from the suburbs drove away with it. In “redneck” Calgary, a Muslim Harvard graduate who teaches University and blogs about urban sprawl was the come from behind winner. 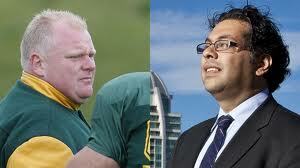 Ford and Nenshi shattered stereotypes, prompting many to scratch their heads and wonder if we’d entered the world of bizarro politics. Beyond the immediate impact Ford and Nenshi will have on the 3.5 million Canadians they now represent is the effect their wins will have on the rest of the country. Is Ford’s win a dark omen for Dalton McGuinty or an opportunity? What does Nenshi’s victory in Calgary do to the already rocky world of Alberta provincial politics? What does this anti-establishment wave sweeping the country mean for Stephen Harper? In addition to these questions, the lessons learned from these campaigns will last…well, at least until the next memorable election. There isn’t a politician in Canada who isn’t thinking about “the gravy train” right now. And there isn’t a campaign manager in Canada who hasn’t looked at Nenshi’s use of social media.